2. 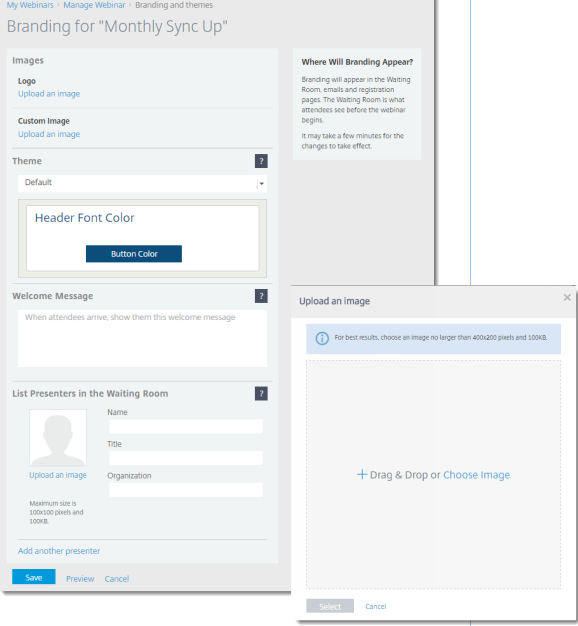 Select " Manage webinar" page and click Edit next to "Branding and themes". Logo: Upload your own logo to increase attendee response rates. Custom image: Upload an image to customize your theme. Theme: Select a look and feel for the session. Welcome message: Create a message that will automatically be sent to attendees once they join the session. List presenters in the waiting room: If desired, add information about and/or a picture of the presenter that attendees will see as they are waiting for the session to begin.